An online demo of the customer frontend is available. CDR-Stats have the following features, and more are being delivered as CDR-Stats is developed. CDR-Stats can also be integrated with many third party applications to create innovative and profitable telecoms services. Telecommunications CDR Mediation to normalise CDR into the same format for rating. Telecoms call rating to put a cost against each call. Multi-tenant design that allows call detail records from multiple switches or PBX systems. Custom alarm triggers can be set to email the administrator for a range of conditions including unusual average call durations, failed calls, and unexpected destinations called. 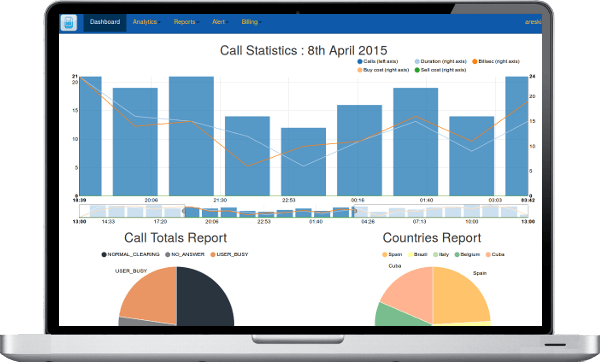 Graphical tools help detect unusual call patterns which may indicate suspicious or fraudulent activity.